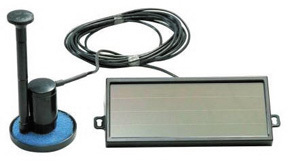 Create your own exciting water feature with our SunJet 150 Plus Mini Solar Pump Kit. Finally, a solar pump kit you can use anywhere, anytime to create your own stunning water feature. Featuring the world's best solar technology from Smart Solar, this product offers unparalled performance, power and dependability. This mini water pump is powered by solar energy, (solar panel included) allowing you to run your pump all day long with no operating costs! The kit comes complete with three heads for a tranquilly beautiful water display up to 10 inches high. A ten foot cable allows easy placement of your solar panel for maximum direct sunlight exposure. Easy assembly with no tools required!